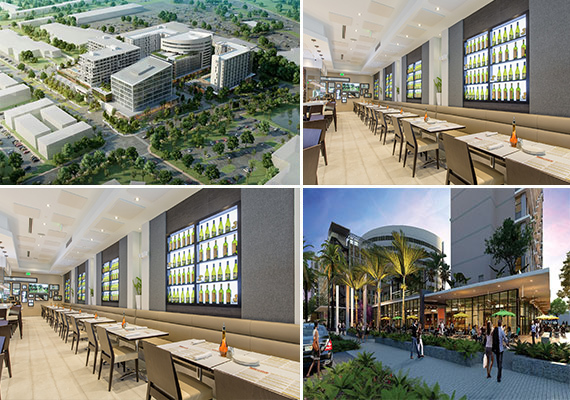 Graziano’s Market and Angelo Elia Pizza Bar & Tapas will lease space at Aventura ParkSquare, joining already announced tenants such as Icebox Cafe, greenmonkey yoga and Barry’s Bootcamp. Coral Gables-based Graziano’s Market will lease 5,000 square feet, including a market, according to a press release. Angelo Elia Pizza Bar & Tapas, which has locations in Fort Lauderdale, Weston, Delray Beach and Coral Springs, will open in a 4,500-square-foot space with outdoor seating. Both are slated to open in early 2017. The Comras Company’s Michael Comras, Jonathan Carter and Michael Silverman are the exclusive leasing agents for the retail component of the 8.5-acre project. The health and wellness-oriented development is targeting tenants similar to those at Sunset Harbour in Miami Beach. In the release, Silverman said the goal is to round out “a robust fitness roster” at ParkSquare. Integra Investments is the developer. When completed, Aventura ParkSquare will feature a “restaurant row” with outdoor seating on Northeast 207th Street. It will also include a 10-story, 40,000-square-foot medical wellness center; a 131-unit luxury residential condo tower; 55,000 square feet of retail space; a flagship select-service hotel; and a 100,000-square-foot Class A office building, the latter of which is fully pre-sold at $56 million. The health-oriented development will also feature extra-wide sidewalks for walkability; open staircases that support less use of elevators; and the elimination of curbs. It will be located on the corner of 2900 Waterways Boulevard and Northeast 207th Street.